Network Data Management Protocol (NDMP) to transfer data from your NAS to your backup devices! Distributed Enterprise Manager for managing larger numbers of Unitrends Backup and Recovery appliances! Scheduled automated recovery testing as well as automated failover! RPO and RTO compliance reporting! Failover to AWS or Microsoft Azure! Unlimited granular Microsoft Exchange server recovery! Aventis Systems is pleased to offer all of our Unitrends Enterprise Plus backup licenses in both per server or per socket subscription licenses. These subscriptions are available in 1, 3, or 5 year terms and are delivered by Electronic Download for your convenience. 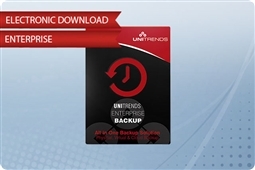 So check out our products below and bring the most robust all in one backup solution to your business today, Unitrends Enterprise Backup Enterprise Plus!